Grubs can over time turn your lawn into a brown, patchy mess. Learn how to identify and then eradicate an infestation before it's bad news for your property. They don’t care who you are or where you live. You won’t see them coming, and by the time they make their presence known, you could have a full-blown infestation on your hands. Grubs! Lawn-loving larvae of various beetles, these tiny trespassers lurk beneath the surface of your grass, feasting on the roots and causing unsightly brown patches. 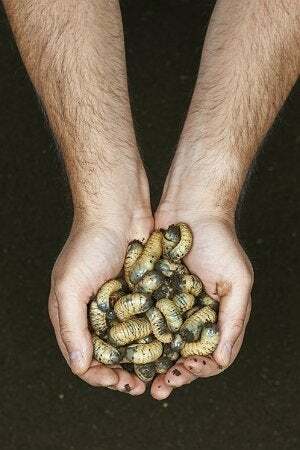 We’ve put together the best ways, both natural and chemical, to rid your yard of greedy grubs. Nearly all lawns have a few grubs, but they rarely cause trouble unless their population soars. The best way to determine if you have a grub problem is to remove a square foot of sod, about 3 inches deep, from the center of a brown patch. Sift through it and look for milky white C-shaped larvae. The buggers can vary in length, from ½ inch to 1 inch, depending on the species of beetle they will eventually become. If you find five or more grubs in the sod you removed, it’s time to formulate a treatment plan. If you’re looking for a natural way to rid your lawn of grubs, consider introducing beneficial nematodes to your lawn. Nematodes (typically of the Heterorhabditis bacteriophora, or Hb, variety) are microscopic parasites that invade grubs’ bodies, releasing bacteria that multiply and ultimately kill the host grub. It can take up to three years for nematodes to establish a colony large enough to eradicate a large population of grubs, but going this route means you won’t have to treat your lawn with chemicals. Be sure to order nematodes from a reputable nursery; they are living organisms that must be transported with care (usually refrigerated) and applied soon after they arrive. Sold in powder form at your local garden or home center—and even via online retailers like Amazon—the Bacillus popilliae spore, sometimes called milky spore, creates a bacterial environment in the soil known as milky disease. It won’t harm your lawn but it’s deadly to grubs (specifically to the larvae). Like nematodes, milky spore isn’t a quick fix. It takes a few years to develop enough of the beneficial spores to rid the yard of grubs. But once established, the “disease” effectively wards off grubs. Beetle eggs need moisture to survive, so if you have a grub problem, you can try making your lawn as inhospitable as possible. If you experience drought conditions during the summer months, when adult beetles lay their eggs, take advantage of the dry conditions by making a conscious decision not to water your lawn for three or four weeks to further dry out the soil. The eggs will eventually die, which will reduce next year’s crop of larvae. Your lawn will dry out, too, but as long as your grass is in good condition, it should spring back to health when you resume watering. Chemical-based grub-control can be very effective, but keep in mind that toxic chemicals can kill beneficial insects at the same time that they kills grubs. Take care to understand the printed instructions for safe use, and be sure to consider the risks that chemical lawn treatments can pose for children and pets. Generally speaking, chemical treatments fall into two categories: curatives and preventives. Curatives, which are designed to kill immature larvae, should be applied in late summer or early fall when young grubs are actively feeding on grass roots. Look for a product that contains trichlorfon, such as Dylox (view on Amazon). Just note that curatives do not affect grubs that have already developed into pupae. 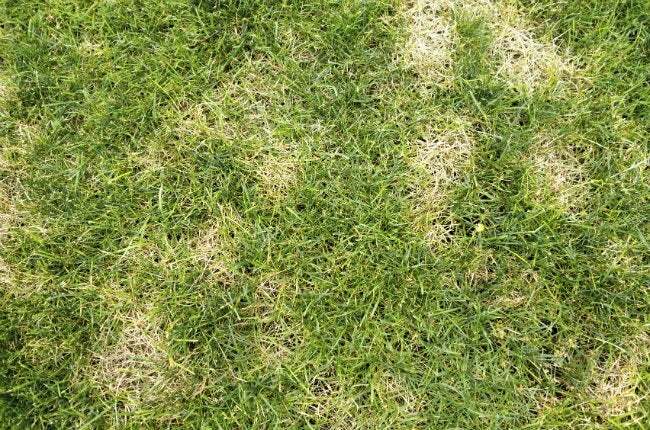 If you’ve had a grub problem in the past, or if you’ve spotted telltale brown patches in your neighbor’s yard, applying a preventive grub-control product will reduce the risk of your lawn becoming infested. Preventive products stop the next generation of grubs, but they have little effect on any young grubs that are currently chomping away in your grass. Look for preventive products that contain either imidacloprid (such as Merit) or halofenozide (such as Mach 2).